Here in urban California, if you want to appear inconspicuous in public, the best way to do so is to wear leather, dye your hair in fluorescent colors, and have all your visible skin tattooed, pierced, or both. I exaggerate, of course—but I think we can all agree that in much of the western world, body art is big these days. Personally, I find the notion of permanently altering my appearance unappealing. My tastes in clothing, hair styles (and colors), and so on change over time, so I don’t want to lock myself into a look I might feel less enthusiastic about in a few years. There’s also the whole issue of pain, which, all things being equal, I prefer to avoid. If I ever were to have a tattoo, though, it would have to be both discreet and very meaningful—something more than mere decoration. One artist is using tattoos on human skin as a medium for literature rather than images, and in an extremely unconventional manner at that. In 2003, New York author Shelley Jackson wrote a 2,095-word story titled “Skin,” which she refers to as a “mortal piece of art.” By the time the project is finished, each word of the story will have been tattooed on a different person’s body; over 500 of the tattoos (and possibly many more) have been completed, using participants from around the world. Jackson last updated the project’s status page in April 2011, and I don’t know what progress has occurred since then. 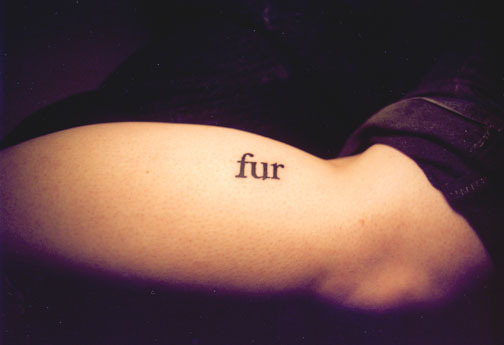 However, in March 2011, just before that last public update, Jackson had an exhibit at the Berkeley Art Museum featuring a video of a subset of the Skin Project’s participants—each person saying their word (in some cases, multiple times) and showing their tattoo, with the words cut together into a different story of about 900 words. Someone who encounters one of the “words,” as she calls the participants, will be able to read at most one word, along with any adjacent punctuation. Volunteers must sign a contract stating that they will receive a tattoo of whichever word Jackson assigns them (in black ink and in a classic book font) and that they will send her a photograph of the finished tattoo as well as a portrait of themselves that does not show the tattoo. Jackson further stipulates that if a volunteer receives a word that could be considered a body part (“back,” say), that word must be tattooed on another part of the body. Only after the tattoo is finished does the participant get a copy of the entire story, which, according to the contract, must be kept secret. Jackson’s intention is that the complete story never be published or revealed to the general public in any fashion; only those who receive the tattoos get to read the entire piece. However, when the work is finished, Jackson hopes to arrange portraits of the participants (not showing the tattoos) in the order in which their words appear in the story, complete with paragraph breaks. When a “word” dies, according to Jackson, the story will change—and she will attempt to attend the funeral, though she expects most of the words to outlive her. When all the words have died, the work as a whole will be dead. The idea for Jackson’s human work of literature came partly from the art of Andy Goldsworthy, the subject of the 2001 documentary Rivers and Tides. Goldsworthy uses only natural materials for his pieces, including icicles, leaves, rocks, and dirt. Many of his works melt within hours, disappear with the next tide, or float away in the river (hence the film’s title). And yet the ephemeral nature of the art is precisely what he means to explore. In Jackson’s story, meanwhile, not only is the work as a whole temporary, but all of its components are also autonomous. Although my tastes in art tend toward the conventional—and I still do not have the slightest interest in getting a tattoo myself—I find something about these organic works of art strangely compelling. If Jackson decides to do an even more ephemeral sequel called “Nails” or “Hair,” perhaps I’ll volunteer to become a word myself. Note: This is an updated version of an article that originally appeared on Interesting Thing of the Day on January 14, 2005.